The iRecovery Stick is a revolutionary product that can make anyone into a digital forensic examiner. 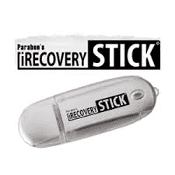 The iRecovery Stick is a USB drive with specialized software that downloads data from iPhones, iPads, and iPod Touch devices. Besides showing all the user data, it recovers deleted data such as text messages (SMS), iMessages, contacts, call history, internet history, and calendar entries.